Mailboxes and their support posts shall be located so as not to interfere with normal maintenance operations. Shoulders narrower than 8 ft. require special mailbox turnouts in accordance with Standard Plan 203.35. For shoulders wider than 8 ft., special mailbox turnouts are not necessary. The post office has established safety requirements, specifications, rules and recommendations for the erection and maintenance of mailboxes. Examples of acceptable mailbox assemblies are available. Individual mailboxes that interfere with maintenance operations or are considered an obstruction should be requested to comply with the post office standards. The local postmaster should be contacted before any action is taken regarding mailbox assemblies that are considered an obstruction. The maximum strength support for erecting mailboxes on a highway is a nominal 4 in. x 4 in. square or 4 1/2 in. diameter wood post or a 1 1/2 in. to 2 in. standard steel or aluminum pipe post. The post is embedded a maximum of 24 in. into the ground. 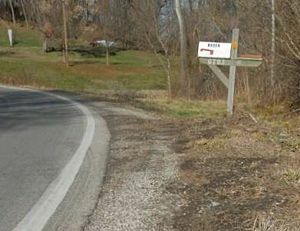 Mailbox turnouts may be provided on resurfacing projects that include some earthwork, such as shaping slopes. Consideration is given to inclusion of this item where the finished shoulders are not of sufficient width to allow a vehicle to get completely off the travelway. When a stabilized shoulder is not provided, the turnout is constructed with 4 in. of Type 1 or 2 aggregate with a 2 in. plant mix bituminous pavement surfacing. Use pipe only when required by restrictive right of way or extreme drainage condition. During the design stage of the project, any mailbox support that does not meet these criteria is noted by location. A written notice is sent to the local postmaster identifying these locations and requesting their assistance in requiring the mail patron to change the mailbox support to comply with these criteria. This will reduce the potential safety hazard along the roadway that results from the use of non-complying mailbox supports. The design file will document that these mailboxes were checked and the action taken through the local postmaster. The District Construction and Materials Engineer is furnished copies of necessary correspondence for use after award of the contract. MoDOT is responsible for the maintenance of mailbox turnouts and these turnouts should be surfaced with suitable material as necessary. This page was last modified on 28 September 2018, at 09:48.